There's been quite a smell wafting through the village of late, I suspect muck spreading is behind it- the smell of the country.... 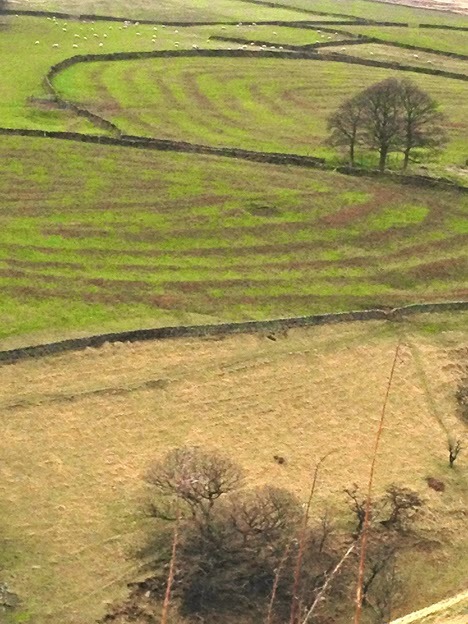 It might cause upset to the stomach, but it looks fantastic on the fields- I took a series of photos yesterday on the way home from my first session for the project Stitching the Wars, at Caroline Court, the Age UK day centre in Hope, Derbyshire, the lines of 'muck' look like map contours, stitched into the hill side. 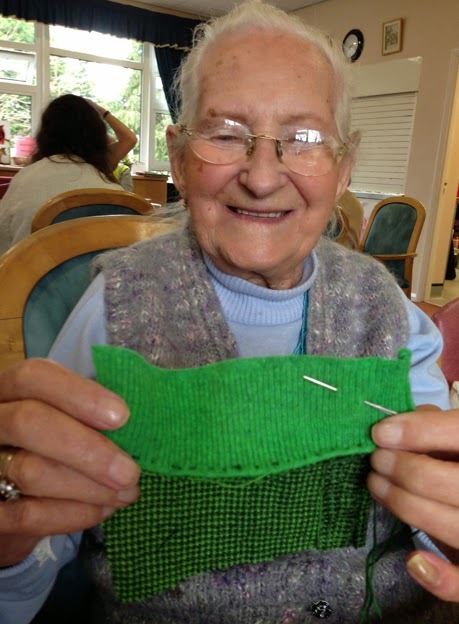 Reminiscence was gathered from the group, including Eileen who described herself as 'only 94'. I’ve always been amongst farmers. The family are still farmers, the younger generation. One of my sons got killed on his own farm. Granddads farm was near to me, cross two field and you were there. Animals, crops, spent a lot of time on the farm- over the back wall, a stile and you were there. I’d help out with the crops and potato picking in the October holidays. I was born in 1919, 26th November so you work it out. My father fought in the 1st World War, but didn’t ever talk about it. Had to wear his uniform even to his wedding. Me granddad had horses and carts, used to dig gravel from Great Longstone Moor and cart it up to Haslop Station. Would do that every day, with 3 or 4 horses and carts. 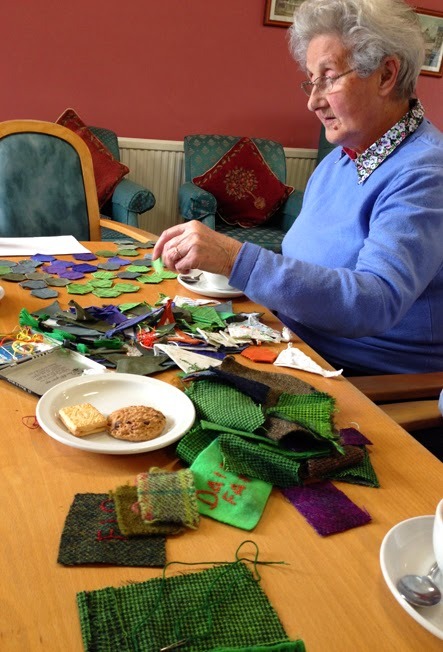 Teresa, (photo below) found great pleasure in arranging the pieces of pieced fabric, moving them into waves of colour reminiscent of flower arranging. 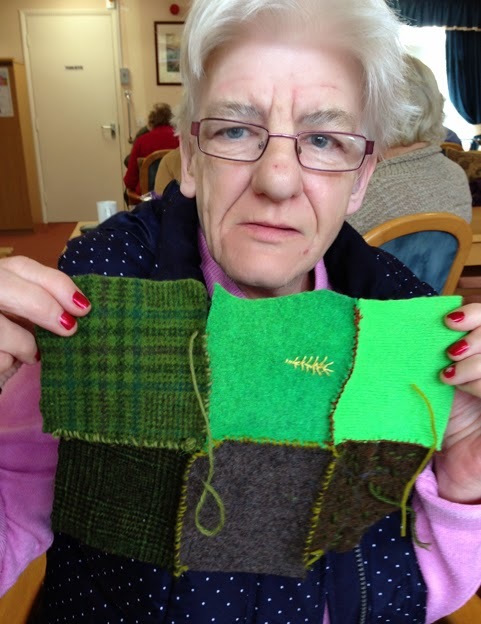 Most of the members of the group and the care staff got stitching the wool and the pieced patchwork quilt, time went quickly. Ursula was born in 1924 and grew up in Eastern Germany boarded by Poland on one side and Czechoslovakia on the other. She happily translated words from her reminiscence into German, which at a later date will be stitched onto the quilts. Bauernhof, a farm, the whole farm the buildings everything. He had pherde- horses, kuhe- cows, schafe- sheep, ganse- geese, euten- ducks, huhner- chickens and two pferde- horses, that was about it. A fairly big farm. We lived opposite. The daughter, we went to school together, in the afternoon she went to collect the sheep and I’d go with her, to drive them home. If they had cows, they had a knecht, the one who has to see to the animals. Magd, is a women who has to do it, who milks the cows. Mother saying ‘get the milk, its time’ don’t go till half past 6, then the milk was fresh, sometimes it was warm. Delicious, so fresh. First thing when I got home a glass of milk. Harte arbeit, hard work. We had chickens and 2 or 3 geese, those geese always running off along the river, had to bring them back along the road, used to be a performance. When my father had to kill a chicken, we all went into the house, then my father would say, ‘I’ve done it!’ and we’d go back outside to pluck it. Pull the down off for bedding, those pillows were so soft and full.